AP Inter 2nd Year Result 2019: AP Intermediate 2nd Year Result 2019 has been declared today at 11 AM by BIEAP. The Board of Intermediate Education, Andhra Pradesh declared the AP Inter result 2019 according to the annual academic calendar of the Board. The AP Inter 2nd year result 2019 has been published online on the official websites – results.apcfss.in and jnanabhumi.ap.gov.in after the formal announcement by BIEAP Secretary, B. Udaya Lakshmi. Alternatively, the AP Inter Result 2019 is also be available on this page and ap12.jagranjosh.com. The online declaration of AP Inter result 2019 allows the lakhs of students to access their result without any inconvenience. BIEAP announced the AP Intermediate 2nd Year Result 2019 for all students from different streams including Commerce, Arts and Science as well as Vocational stream students, simultaneously. Our team will provide regular, timely and verified updates about AP Inter Result 2019 on this page. Jagranjosh.com is in constant touch with the officials from BIEAP and therefore will be able to bring the latest information about the AP Intermediate Result 2019. Alternatively, to get these latest updates, students can also register for the email alerts by providing their information on this page. How to check AP Inter Result 2019? What after AP 12th Result 2019? Along with providing you the option to check your AP 12th Result 2019 online on the website, the students will also be provided the facility to either download a soft copy / take a printout of the scorecard for future use. The printed copy of the AP 2nd Year Inter Result can be used for planning your academic future ahead. However, colleges/universities/higher education institutions will not accept it for admission purposes. Therefore, the students must collect their original mark sheets from their respective schools/institutions in the coming days. Apart from these, after the AP Board Inter Result 2019 is announced, students will have to decide their career path and choose the right graduation programme. To make it to their dream programme, they will have to take several entrance examinations such as AP LAWCET, AP EAMCET, JEE Main and NEET. After the AP 12th Result 2019 are announced, there may be celebration for some while some may be disappointment with their performance in the exam. There are instances where a student may feel he had done better than the scores obtained, in such case he may seek for re-checking/ re-evaluation process that is offered by the AP Board. The students who are not fully satisfied with AP Intermediate Senior result 2019 have the option to apply for rechecking/re-evaluation. The students who wish to avail these facilities are required to pay a sum of Rs. 260/- per paper for recounting of marks and Rs. 1300/- per paper for a scanned copy as well as re-verification of answer sheet. The last date of payment of the non-refundable fee for AP Inter result 2019 rechecking/re-evaluation in 22nd April, 2019. The AP 12th Result 2019 may bring bad news for the students who do not score passing marks in the AP 12th exams. In such cases, they will be provided with another opportunity to prove themselves. The students will be able to appear for the compartmental/ supplementary exam. The supplementary examination is likely to be held in the month of May/June. Students will be required to contact the Principal of their respective institution to pay the examination fee for AP Board Intermediate Supplementary exam 2019. Students are advised to bookmark this page for any update on the AP Board Inter Result 2019; they can also fill in their details on the link shared in this article to receive notification in regards to the AP Intermediate Result 2019. Established in 1971, the Board of Intermediate Education, Andhra Pradesh (BIEAP) was formed to regulate and supervise the Intermediate education system in India, in the state of Andhra Pradesh. The board was set up to specify the courses of study in the state. The Directorate of Government Examinations is popularly known as the Andhra Pradesh SSC Board in the state. The Board of Secondary Education, Andhra Pradesh (BSEAP) is an independent agency working under the aegis of Ministry of Secondary Education, Government of Andhra Pradesh. The SSC Board is responsible for promotion, management and development of secondary level school education in the state. Similarly, the Intermediate Board Exams for Class 12 students are conducted by the Board of Intermediate Education, Andhra Pradesh (BIEAP). As part of its various responsibilities, the BIEAP prescribes the syllabus and course curriculum for 1st Inter and 2nd Inter students. They also conduct the annual board exams for these classes in the month of February-March, every year. AP Intermediate Result 2019 has been declared. Know how to check AP Inter Result 2019 online on jnanabhumi.ap.gov.in and results.apcfss.in. AP Intermediate Results 2019 for 1st and 2nd Year has been officially declared, as per the latest news from the BIEAP. Students can check AP Intermediate result 2019 online at results.apcfss.in. AP Inter Result 2019 has been declared by the BIEAP. To check your AP 11th result 2019 and AP 12th result 2019, visit the official websites of Andhra Pradesh Board- results.apcfss.in and jnanabhumi.ap.gov.in. The result is also available on the result page of JagranJosh – ap12.jagranjosh.com. 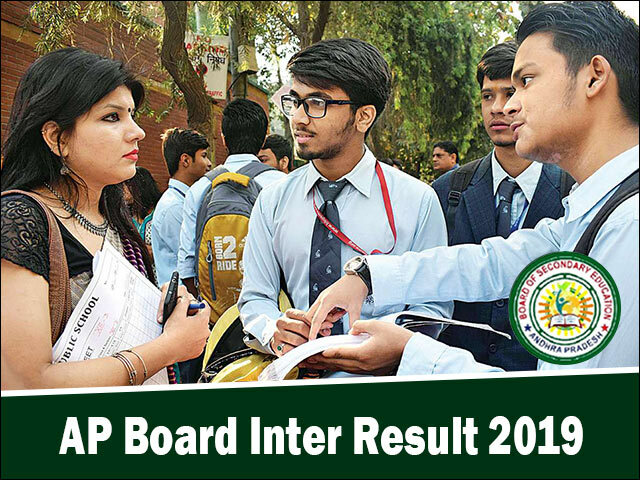 AP Board Inter Results 2019 has been declared by the BIEAP. Students can now check their results online on jnanabhumi.ap.gov.in and results.apcfss.in. AP Inter 1st and 2nd Year Exam 2019 Hall Tickets Released. BIEAP has released the AP Intermediate Exam 2019 hall tickets at jnanabhuni.ac.gov.in and manabadi.co.in. Check updates here. A total of 10.6 lakh candidates will take the AP inter exam this year. The Board of Intermediate Education Andhra Pradesh, BIEAP, declared the AP Intermediate 1st year Result 2018 today on the official website of the board i.e bieap.gov.in. The Board of Intermediate Education Andhra Pradesh (BIEAP) announced the AP Intermediate Results 2018 today on the official website of the board i.e bieap.gov.in. The AP1st Year Result 2018 has been announced by the BIEAP. Students can check their Andhra 1st Year Inter Result online here and download the mark sheet here. The Andhra Pradesh Board Intermediate 2nd Year Result 2018 was declared today by the Board of Intermediate Education Andhra Pradesh. The Class 12 students can now check their AP Board Inter 2nd Year result on the official website, i.e. bieap.gov.in. The Board of Intermediate Education Andhra Pradesh has announced the AP Intermediate Result 2018, today. The students can now check their AP Board Inter 2nd Year result on the official website, i.e. bieap.gov.in. The Board of Intermediate Education Andhra Pradesh, BIEAP results will be announced on April 12th and 13th for Class 12th and 11th, respectively. The AP Board Inter Supply Results 2017 have been announced. The Board of Intermediate Education, Andhra Pradesh (BIEAP) has announced the AP Inter Supply Results 2017 today morning at 11AM. Students can now check their AP Inter Supplementary Results 2017 online on official websites results.cgg.gov.in and bieap.gov.in. AP Inter Result 2017 for 1st and 2nd Year students announced. Andhra AP Board Results 2017 for Inter 1st year and Inter 2nd Year are now available online on the official website bieap.gov.in and resuts.cgg.gov.in. BIEAP announced the Intermediate Result 2017 for 1st year and 2nd year students. Girls emerged on top again in BIEAP Results with the overall pass percentage of 77%. The Board of Intermediate Education, Andhra Pradesh (BIEAP) announced the AP Board Results 2017 for both 1st and 2nd year students today. Students can get their results online at bieap.gov.in and results.jagranjosh.com. The Andhra Pradesh Board Intermediate Education announced the 1st Year and 2nd year Inter Results 2016 today at its headquarters. The ceremonial declaration function of the AP Junior & Senior Inter Results 2016 was attended by the Education Minister as well as senior officials of the board. AP Inter 1st Year Result 2016 and AP Inter 2nd Year Result 2016 Declaration Date Confirmed: Easing the tension and stress of lakhs of students, the Board of Intermediate Education, Andhra Pradesh has announced that the AP 1st Year and 2nd Year Inter Results 2016 will be declared on 19th April. The news has been welcomed with cheerful joys of worried students, who have been waiting for the AP Intermediate Results 2016, since almost two months now.